Sydney captain Josh Kennedy is used to being tagged but the star midfielder is set for some close attention during summer. New Swan Ryan Clarke is looking forward to shadowing the big-bodied midfielder after arriving for the first day of pre-season training. 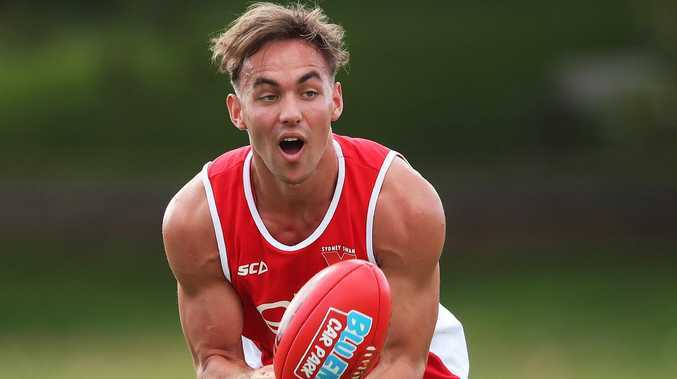 The former Kangaroo moved north during the AFL's trade period, the Swans giving up pick No.62 to acquire his services. Clarke looms as Dan Hannebery's likely replacement but will face stiff competition from the returning Callum Mills, Ollie Florent and Jake Lloyd. "There's some superstars of the modern game in the Swans' midfield so I'm really looking forward to getting started and I'm going to try and soak up as much information as I can," Clarke said. "I'm going to (do a) fair bit of work with (Josh) Kennedy and see how he attacks the contested ball. "I had some really good midfielders like Shaun Higgins and Ben Cunnington to learn from at North Melbourne. "I'm also looking forward to adding a few more strings to my bow, like consistency, getting a bit better on the inside, and adding some polish on the outside." Clarke played 40 games for the Kangaroos, including 19 this year as he averaged 19 disposals and 1.6 tackles a game playing mainly on the wing. North Melbourne face Sydney in Round 9 in Hobart but Clarke has bigger fish to fry before facing his former teammates. "I'm not looking that far forward, Round 1 is my goal so I'm not looking past that," he said. The Swans lost Hannebery, Nic Newman and Gary Rohan during the trade period, adding Clarke and delisted free agent Jackson Thurlow from Geelong. After seeing former teammates Josh Caddy and Nathan Vardy win premierships, Murdoch was confident he could he could make the most of his second chance. ""You hear about the culture and the way this footy club has been built over the past 20 or 30 years, it's a real powerhouse," he said. "The other thing you hear from the outside is that the Swans have got a real knack for investing in good people, so coming to the club you know you're going to be surrounded those sorts of people. "Plus, a lot of guys that have left Geelong in recent years have all had some really good success. "Nathan Vardy left (for West Coast) and he won a flag, Josh Caddy left (for Richmond) and he won a flag, and even Joel Hamling left (for the Western Bulldogs) and he won a flag."